We construct quality and durable Crowns and Bridges to replace or restore teeth where a simple filling is not appropriate. These prosthetic teeth are constructed locally as we work intimately with our local dental laboratories. A crown allows for us to restore the tooth back to its original shape whilst retaining incredible strength to allow the tooth to function just as it was when it was brand new. 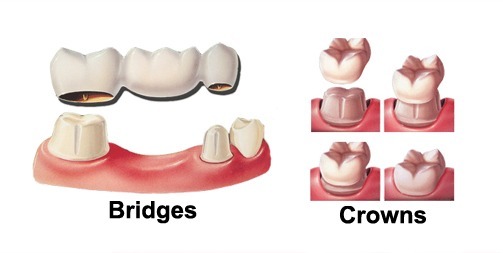 A bridge allows us to fill in gaps in your mouth without resorting to a denture or an implant all the while it strengthens the adjacent teeth that the dental bridge fits over. Come see us and we will provide you with a consultation to determine the best course of treatment to achieve your goals!